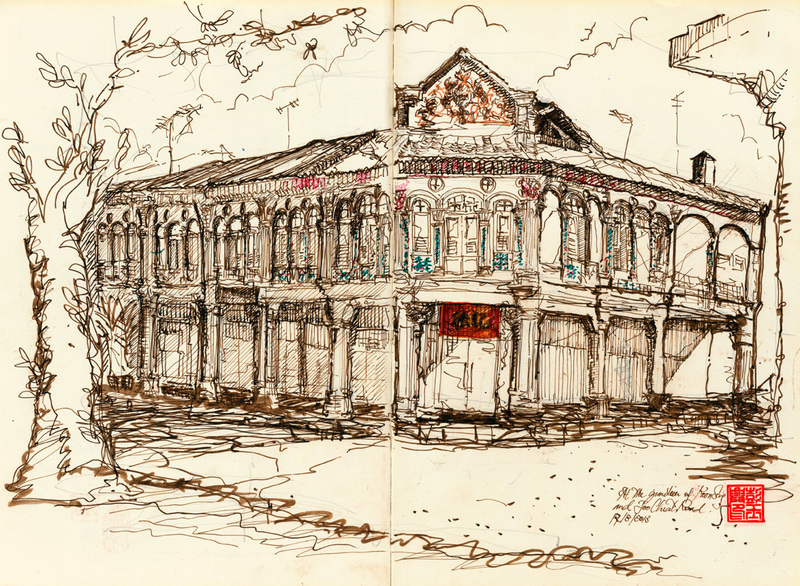 Musings of a Citi Sketcha: Building at the Junction of Koon Seng and Joo Chiat Road. Building at the Junction of Koon Seng and Joo Chiat Road. Conservation Peranakan-style shophouse at the junction of Koon Seng and Joo Chiat Road. Koon Seng Road is named after Cheong Koon Seng (b. 1880 - d. 1932) in 1934. Before that, it was known as Lorong East Coast. Cheong Koon Seng was one of the first 13 students of Anglo-Chinese School. He went on to build the old Theatre Royal and Star Opera Company which used to be located along North Bridge Road. Professionally, Mr Cheong was an auctioneer, a real estate agent and a charter member of the first Rotary Club of Singapore. Meanwhile, Joo Chiat Road is named after "King of Katong" Chew Joo Chiat. Koon Seng Road was a predominantly used for residential purposes, but it had a bustling atmosphere as a business centre with all the shophouses lining the street. The area was originally a Peranakan enclave until the 1970s when Peranakans began moving to other parts of Singapore. Secret societies used to be very active in the area then. Triad gangs such as Gang 18 and 36th Pai 'controlled' the area around this road. Old kampongs that use to be situated around the vicinity proved to be good hiding places, especially for their weapons. Although violence was limited to inter-gang fights and did not affect the residents directly, those who grew up in the area in the 1950s would remember scenes of violent fights that were fervent and common then.